English politician who was installed as the Deputy Prime Minister of the U.K. in 2010. He began representing Sheffield Hallam in Parliament in 2005. In 2016, he became a vocal opponent of Brexit, using his stance as a campaign platform in 2017. He graduated from the University of Minnesota and Cambridge, where he was active in the school's theater scene. 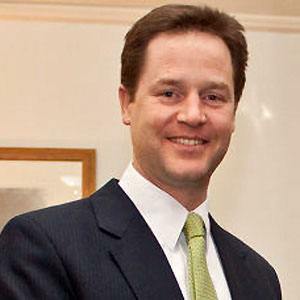 He was named the Leader of the Liberal Democrats from 2007 to 2010 and is a fluent speaker of five European languages. He married Miriam Gonzalez Durantez in 2000. He has three sons, Antonio, Alberto, and Miguel. He served as the Deputy to Prime Minister David Cameron .